Sentence is long, but the important thing we are writing, please read certainly to the last minute. First, in our circle　"Kobe Fighting Network", through the martial arts are intended to be a friend to look for relationship. Encouraged to participate as much as possible on an ongoing basis. So there is no technical guidance by a professional, such as a gym. 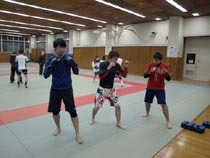 we have to practice with the aim of "enjoy martial arts". For monthly participation fee of practice meetings, we had been decided 2000 yen a month as hall fee etc.. Observer's fee is free. We will give you the bank transfer form when you join for the first time, please fill in the required matter, stamp and return it to the staff. At the time of participation of practice meeting for the first time, we will be happy to collect 1000 yen as membership fee. Please note. Spot participation (including guest and experiences) is 1,000 yen once. In the case of referrals of members of the association, it will be half price. If you come the first time (including for guests), please please contact participation by email or phone in advance certainly. About injured in an accident at work or trouble, the staff can not be held responsible, thank you participate in practice at your own risk. Also in case of emergency, please consider also join sports insurance. Event is engaged in basic practice of hit, groundwork, mixed martial arts. Specifically, the center is done to glove karate, kick boxing, mixed martial arts, grappling, submission wrestling. We do not treat such as judo, Bragilian Jujutsu, traditional karate, and the events that wear uniforms, and compete for beauty of form and technique. Those who also experience, dress does not have a button, zipper, hood, or bracket (T-shirt , rash guard and short pants), please bring. You do not need shoes. (If you come to the cold season, please come in and with warm clothes.) When you do exercise preparation, it is not as far as it. Hyogo Prefecture Gang Exclusion Regulations came into force, even in KFN, stakeholder participation of anti-social forces that threaten the order and safety of society for example organized crime groups is prohibited. From the peculiarities of martial arts, we will refuse people with disabilities mentally and physically, and the person suffering from infectious diseases. However, persons with disabilities, you can join us by the degree, please contact us in advance. The overlapping membership registration with other martial arts gym, we have refused unless consent of gym's representative etc.. When you came to practice meeting at the beginning, we ask you register (notification of emergency contact) as a member. 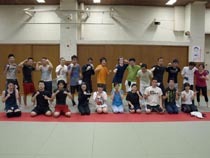 (except guests) And management of meetings, emergency response, such as accident or injury, does not change the sports gym and dojo except for the membership fee, please cooperate. You will not be able to join the practice meeting that there is no registered members of second time. We are scheduled to be published in various media, such as blog, website , SNS and so on about practice sessions and matches, and other activities. If you can not get a note about using the circle of our public relations video and photos taken, we will refuse to take part in this circle. Copyright and portrait rights of video and photos you shoot is attributable to our Kobe Fighting Network. Please see the page of "Notes". Why did you check this website? Was it because you wished to become stronger? Was it for your health, diet, or to make new friends in Kobe, Japan? Or are you a martial artist looking to connect with people in your community? KFN(Kobe Fighting Network) is a sport club for martial arts. 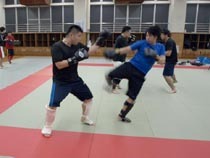 We practice all kinds of martial arts, like kickboxing and grappling at the Oji Sports Center in Kobe every Sunday. I am the club leader of the KFN chapter. I used to go to a boxing gym before. The gym opened everyday, but I could only go there twice a month because of my work schedule . However, I needed to pay the monthly fee (more than 10,000 yen) and the entrance fee(10,000 yen). I felt it was very expensive considering my circumstances. So, I decided to build a sport club like KFN, which is a very reasonable martial arts club. Adult male members only need to pay 300 yen per practice and this includes the gym fee (women and minors 100 yen). We charge a one time entrance fee for joining the club. We practice once a week, so for people looking to become pro martial artist, this may not be enough training. However we occasionally have pro martial artists come in and spar with us for extra practice. Our goal is for people to join and enjoy the club, and create a great environment together. Please support us and join the club if you are interested.